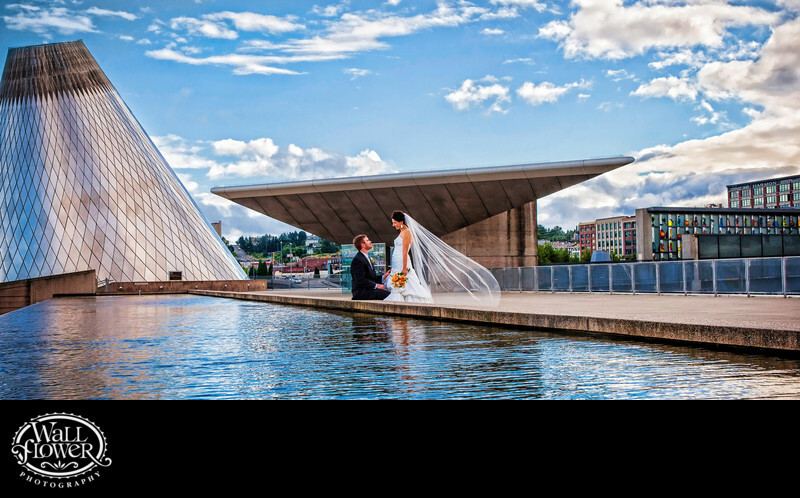 It was a breezy day when I posed this bride and groom by the reflecting pool on the Rooftop Plaza of the Museum of Glass in Tacoma, Washington, and then I took my position and waited for the wind to do something photogenic with the bride's long veil. This photo was the best, and won an award in the International Print Competition (IPC) of the Professional Photographers of America (PPA), being accepted into their General Collection for 2013. The Hotshop Cone is prominent on the left side of the image, and on the far right you can see the Venetian Wall on the Bridge of Glass, which displays 109 different sculptures by world-famous artist Dale Chihuly.